Raja Ampat in the easternmost province of Papua, lures divers and ocean-lovers alike with its rich and biodiverse marine life, stunning landscape views and tourist-free beaches. islands of Misool, Salawati, Batanta and Waigeo. The name comes from an local mythology about a woman who finds seven eggs. Four eggs hatch, becoming kings who occupied the four main islands. The three other eggs hatched as a woman, a ghost and a stone. For years Raja Ampat has been an undiscovered marine paradise, but lately the secluded area has become more popular among divers. Homestays and dive shops has been popping up during the last two years and transportation has become more regular. Raja Ampat still feels untouched and maybe that's why the marine life is so vivid. There's no doubt that Raja Ampat could become the new Bali, if the Indonesian government doesn't stop business men, who will surely find a market for resorts, bars, restaurants, big boats and hordes of tourists. If that happens, Raja Ampat is about to lose its unique status as the Holy Grail of diving and probably some of its marine life too. First of all, Raja Ampat is not for inexperienced divers or swimmers. Neither is this place geared for tourists with luxury habits. There is a malaria risk in Raja Ampat, but being far out in the ocean the risk is low. We took malaria medication during our stay, but we saw very few mosquitoes. Homestays provide mosquito nets. Some people ignore the risk, others like us go by with better safe than sorry. Bringing your own snorkeling gear is a minimum. Mask, snorkel, fins, rash guard, swimsuit, sea drops and toothpaste are the essentials. Dive shops can provide you with scuba gear for your dives. Make sure to bring plenty of cash. Not every homestay or dive shop accepts credit card. The power can be unreliable, so even if they do, it might not work. There's an ATM in Sorong Airport. 2. How To Get To Raja Ampat? 6. Got picked up by our homestay. 3. Where To Stay In Raja Ampat? There are plenty of islands to stay on. But everything is quite new to tourism. There's no resorts yet, only simple bungalows on the island shores. We stumbled upon more locals than tourists during our stay. And the few other tourist we saw were scuba divers like us. 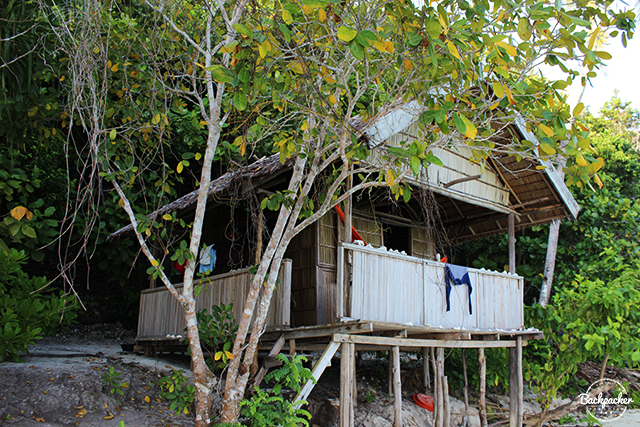 We stayed in Kri Island at Warahnus Homestay paying 800.000 IDR per night for 3 persons (including 3 meals a day). There are several homestays and islands to stay in. Kri Island has no luxury (no shops, limited power etc. ), whereas Arborek Island hosts more local inhabitants. There you can buy coke, beng beng (chocolate) and even cigarettes. 4. What To Do In Raja Ampat? As a guy who scuba dived (/free dived) some of the best places in Maldives, Philippines, Thailand and Australia, I can promptly say; Raja Ampat has some of the most untouched and biodiverse marine life on this planet. So obviously scuba divers are drawn here. Raja Ampat's newly gained status as a diver's paradise is nearly an understatement. At the dive site Cape Kri famous marine biologist and respected author Dr. Gerald R. Allen spotted a world record of 283 species... in ONE SINGLE DIVE. The current at Raja Ampat varies from quiet to very strong, depth from 10 to 40 meters, visibility from 10 - 40 meters, water temperatures are stable all year at around 28 degrees celsius. 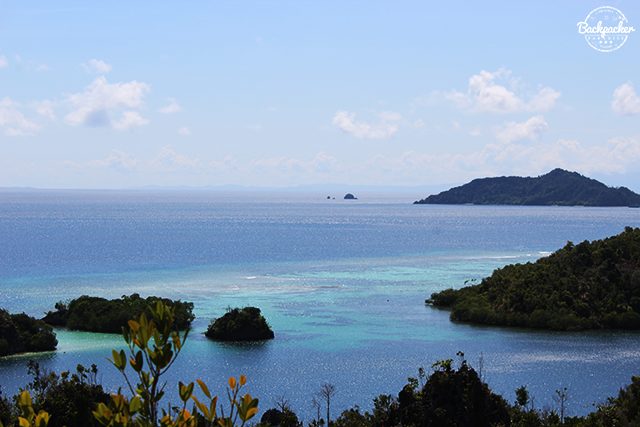 Raja Ampat has more than 200 dive sites and is for intermediate or experienced divers. Nudibranches, stingrays, huge schools of fish and a wide variety of soft corals in not uncommon to spot in these waters. After all, 70% of all known marine life has been spotted in Raja Ampat. Bring your own snorkling gear as most homestays do not offer any kind of rental gear. Snorkeling is a must and I can assure you; you are gonna spend hours upon hours out on the reefs. The possibilities are endless, so here's some of the reefs we snorkeled during our stay. This reef is located right outside the doors of Waranhus Homestay. We did several snorkels here and never one without spotting sea turtles. Green sea and hawksbill. 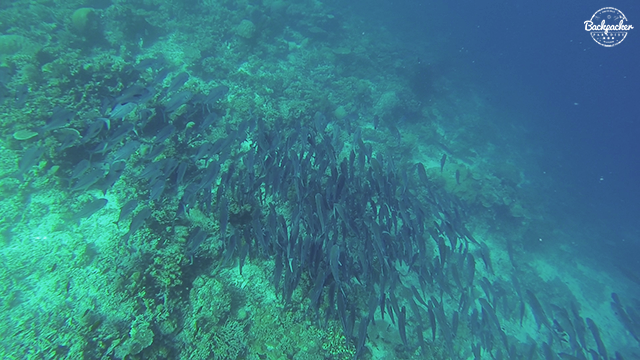 Besides the sea turtles we saw a huge school of humphead parrotfish, about 40-50 of them passing by. Blacktip reef sharks were not an uncommon sight either along with endless amounts of smaller fish species. The snorkling at Arborek Island is nothing like at Kri Island. 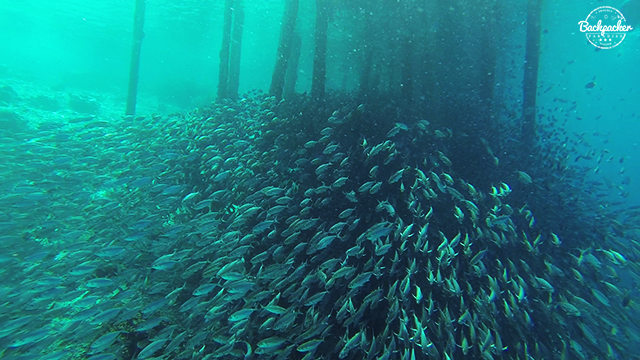 There is no larger reefs, but a popular place to stick your head underwater is at the pier. A huge school of tunas tend to gather here along side smaller groups of angelfish. Named so because of the white and red receiving antenna on Mansuar Island, which is easily spotted from the water. The current here tend to be very strong and it's advisable to have a boat following and picking you up. The reef is quite long and visibility absolutely outstanding. 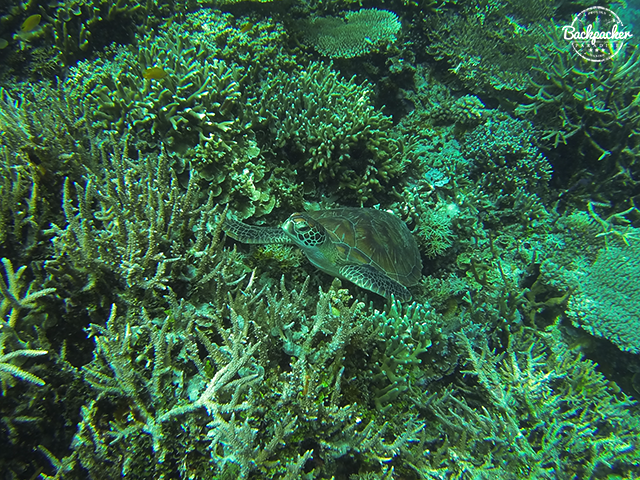 We spotted quite the amount of sea turtles and humphead parrotfish as we drifted along the reef. Melissa Garden is located inbetween three tiny rocks near Piaynemo. Heavy current haunts the area and enjoying the details here can be difficult as you're thrown around the reef. Worth a visit, if you're at Piaynemo anyway. Near Koi Island we snorkled the shallow waters along some of sand dunes. We spotted several rare surgeonfish, a single blacktip reef shark, a lonely humphead parrotfish and a beast of a thelenota ananas. 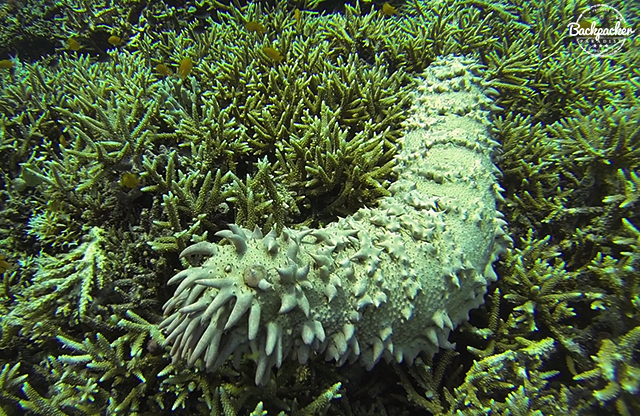 More commonly known as the ananas sea cucumber, this odd looking creature is edible and considered a delicacy in Eastern Asia. Commercial exploitation has declined the population of the ananas sea cucumber by 80-90% and they are now enlisted as endangered. Cape Kri is considered a dive site for more experienced divers. The current is strong and you have no choice but to drift along. 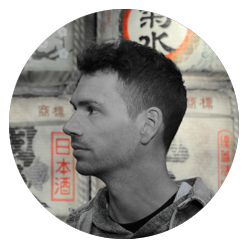 Do make sure you've got a local boatman with an eye on your position. That being said it's worth the effort. This is the reef with the world record for most species spotted in a single dive. We didn't quite make it to 283, but we did spot quite a few. Among them was a napoleon wrasse and a large school of trevallys. I've seen manta rays before (in Maldives), but nothing beats Manta Ridge south of Arborek Island. A dive spot, but not much else to see here beside mantas. Snorkeling is fully satisfying if you're lucky enough to spot a manta or two. before we spotted the first two mantas. 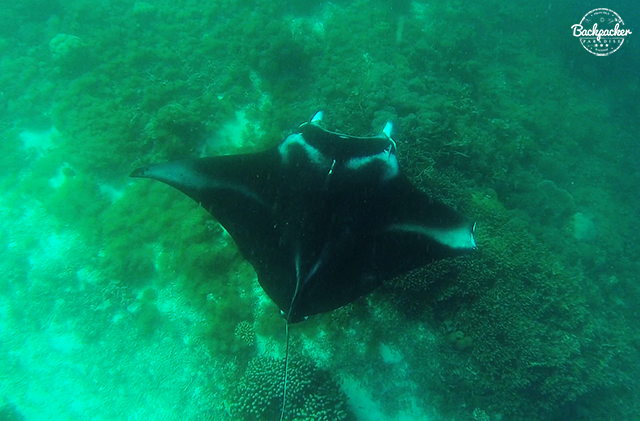 One of them being a HUGE oceanic manta ray with a wing span of approximately 7 meters! I have no idea for how long we snorkled or how far, but we followed at least 4 or 5 different mantas out there. At the end the very first oceanic manta ray came back. I guess he'd gotten curious because he slowly began to enter shallower waters. Excited to have a closer look, we tried to keep up. As he reach the peak of the reef, I dove down and got right above him - less than 2 meters from this giant and elegant creature. He didn't seem to be scared, so I soared awhile with him, enjoying the moment and forgetting about everything else. 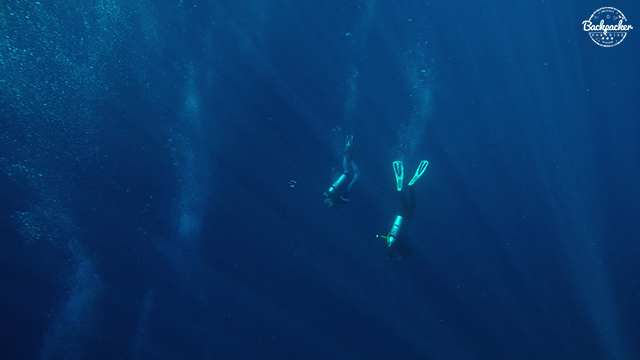 As he drifted over the drop-off and into deeper waters, I felt my lungs aching in pain and my brain screaming for oxygen. So I gave him one last look before beginning my ascend towards the surface. There are many sand dunes in Raja Ampat, some of which disappears and then reappears with the tide. We visited one in-between Koi Island and Cape Kri. 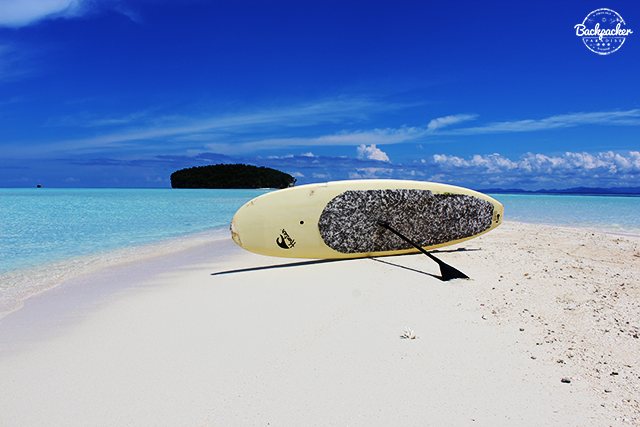 A few local fellows offered paddle boards rental. Besides that, it was just sand, with a smaller reef around it. Picture perfect nonetheless. 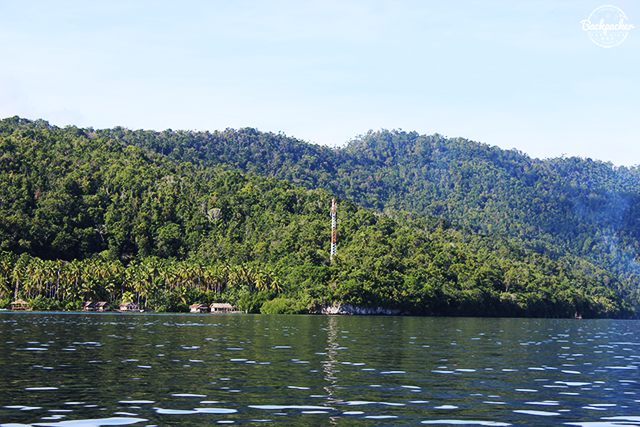 Some say, that the real Raja Ampat is at Wayag. Wayag is far though, which makes a trip there very expensive. Piaynemo - also named Little Wayag - is closer and way cheaper to reach. We took a day tour to Piaynemo including a few view points and several different snorkeling sites. When it comes down to naming the real Raja Ampat, it's not Wayah nor Piaynemo. The real Raja Ampat is underwater, just waiting to be explored. 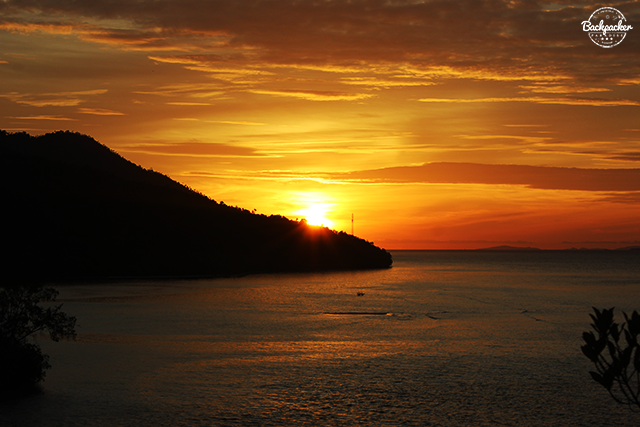 Beautiful sunsets are available in various places around the globe, so what makes a sunset at Raja Ampat special? I mean first of all you get to see the sun sink slowly into the sea. Secondly, there's just something about watching a sunset this far out (and for me, this far from home). We hiked the western part of Kri Island to a small sunset view point. No one else was there beside us, as the sun painted the skies orange. As the sun goes down and the stars begin to appear on the night sky, the waters surrounding Raja Ampat is not yet ready to let you sleep. Bioluminescence (or glowing plankton) comes to life as you move around in the shallow waters near the shore. The bright blue lights whirling around your arms and legs will without a doubt bring out the 10-year old kid in you. 5. 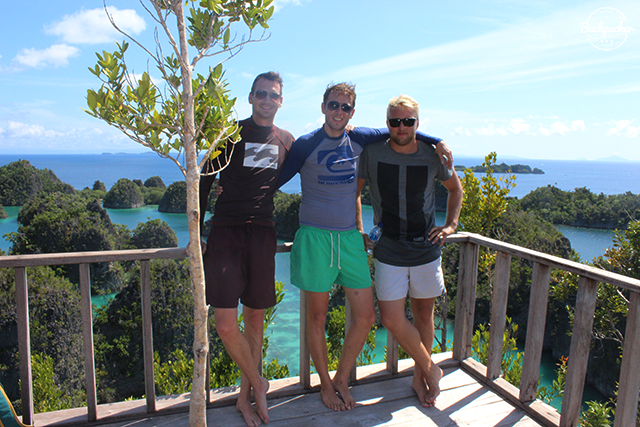 Staying Costs In Raja Ampat? Wonderful article that you have shared here about the Raja Ampat traveling. Your pictures are very beautiful and I liked your way to share this article here. If anyone looking for the affordable Omo Valley travel & Tour packages, Visit here.